What are we to make of South Africa’s latest elections? 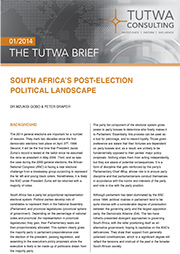 In this, the first Tutwa Brief, we outline the key processes, players, and issues in order to chart broad contours of the post elections policy landscape. Clearly the ANC is going to win, but by how much, and is it really that simple? How could the results influence its economic policy direction, in particular? These issues are laid out in accessible format, and will be revisited in a post-elections blog once President Zuma’s cabinet has been announced.